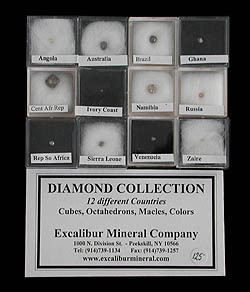 OFFERS FROM EXCALIBUR MINERAL CORP.
A comprehensive collection of over sixty (60) different diamonds in fifty (50) numbered boxes, covering all localities we currently have on hand. 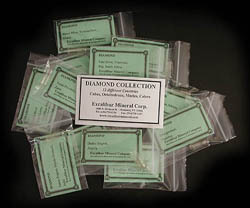 There will be a wide range of crystal habits and colors, many only available in this set. If it's diversity you seek, this is it! This is the largest collection we can supply @$3000 per set! SORRY, THESE ARE SOLD OUT & NO LONGER AVAILABLE AT THE PRESENT TIME! 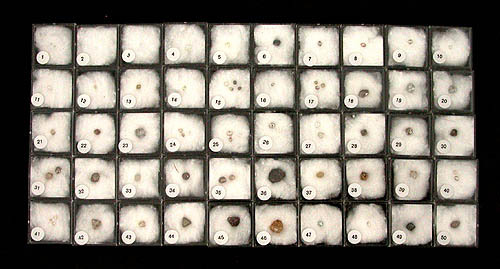 Twelve (12) diamond crystals from different countries, showing a variety of crystal forms and/or colors! A difficult lot to assemble, available either as a boxed set @ $125, or simply as individually bagged and labeled collections @ $100 (CURRENTLY SOLD OUT! ), both add $6.00 shipping and handling.